Today’s post can be seen as a real world example of how to compile a wish list, part of the “Polish your style” series. The sudden heat wave that hit Sydney last weekend initiated a rushed fashion review of my wardrobe. I realised that a few new things must be added to make it ready for summer 2013. In short, my wardrobe needs an update! As there are enough of color and prints in my wardrobe, I decided to add more white basics to it. Classic pieces like that will last a few seasons and allow me to create multiple outfits by combining them with the colorful pieces and/or adding bright accessories. 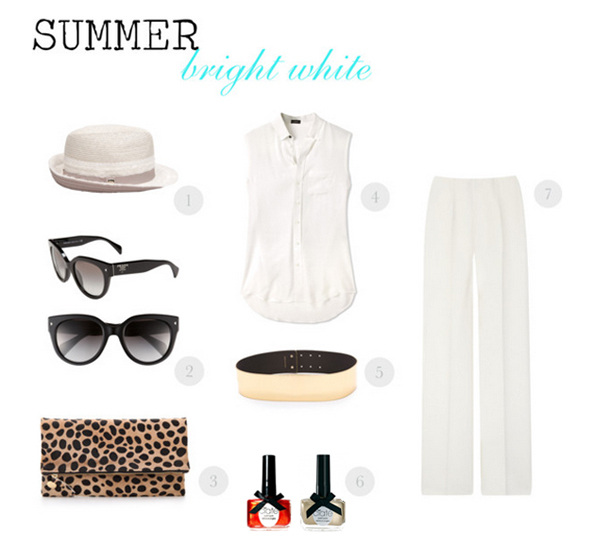 Of course, the austere purity of a white outfit is perfect for summer too, just add Grecian style sandals and a tan. It’s that simple! 6. Ciate Bottled Sunshine and Sand Dune Nail Polishes – pretty nail polish on your nails is the best summer accessory! 7. Hypothetical white wide leg pants… seriously I can’t find a pair of white trousers like this neither online nor in stores. But I’ll keep searching. I would love to wear white!! But for me it’s a recipe for disaster! because I always end up spilling something on myself!